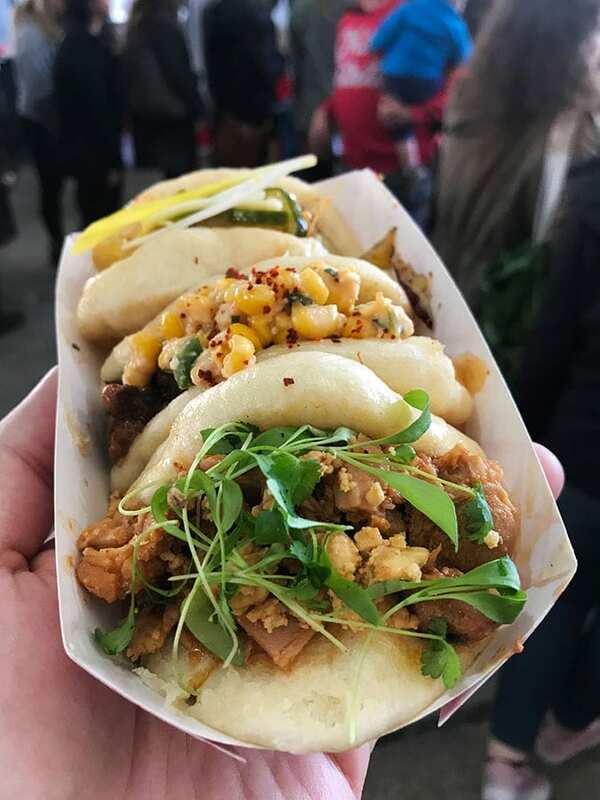 It’s another year, and we are back again at one of our favorite foodie events of the year the Emporiyum in Union Market. One of those events where you will leave a few pounds heavier and happier because it’s all worth it. 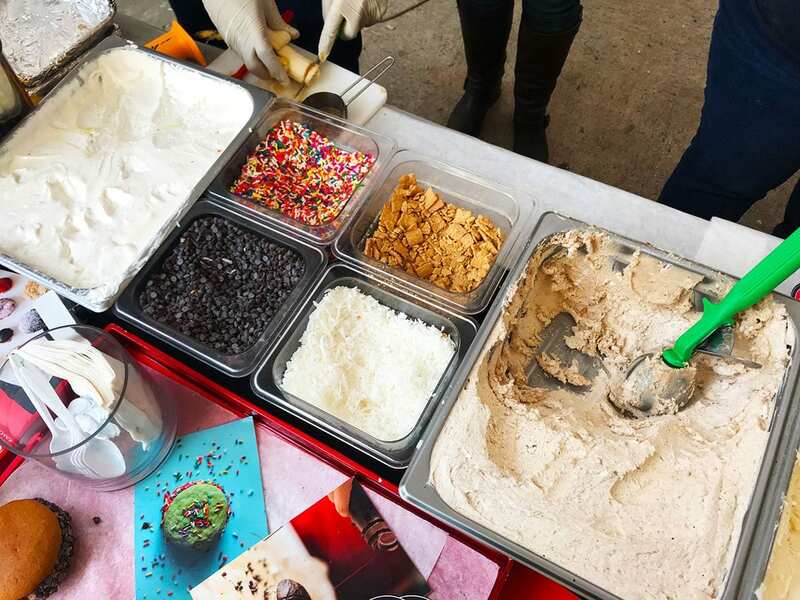 Under one roof everything a hungry nomster might want from savory to sweet, and even new substring flavors. It was great to see some familiar vendors from last year and even better to see several new ones. 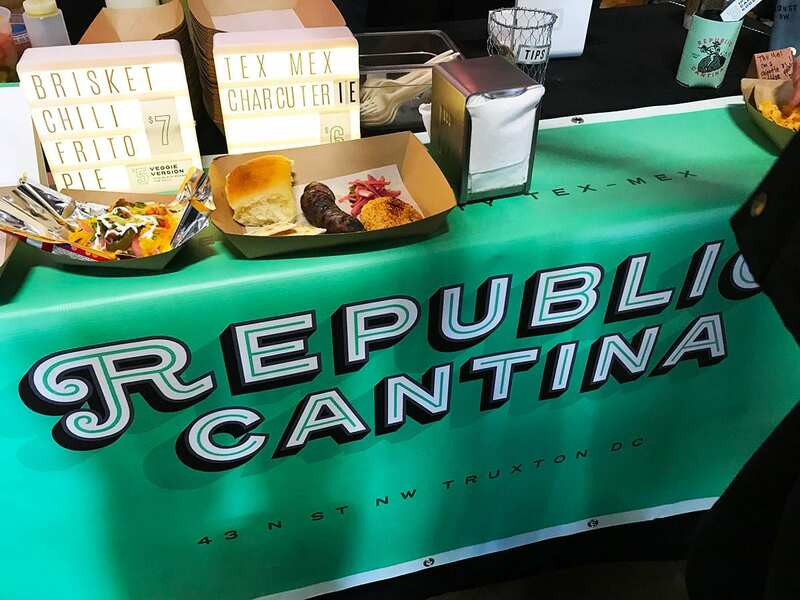 You must come hungry and eager to try new and amazing food from Union Market, local restaurants, and out of state vendors. Make sure to check read our other Emporiyum reviews. Emporiyum sells different kind of tickets for different time slots. We highly recommend going with VIP 10:00 am because it’s early enough not to eat before. Plus you get to skip the long line to eat much earlier with shorter lines. Most people tend to go at 11:00 am or even later which trust us added for longer lines. Emporiyum is a popular event, and it can get crazy. Don’t go for long lines and come back closer to the next wave of people. 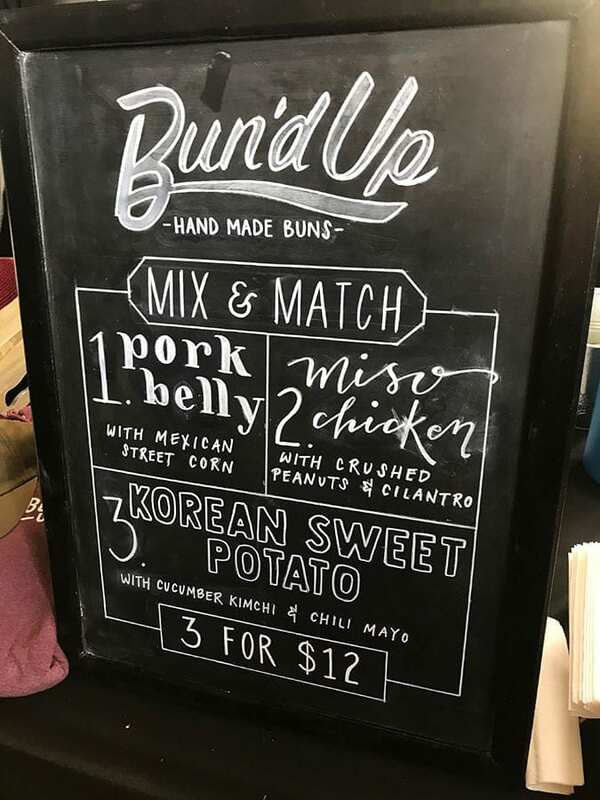 We are going all buns for some Buns from BundUp during the Emporiyum. We saw people walk around with plates of these beautiful buns and knew we must have them. 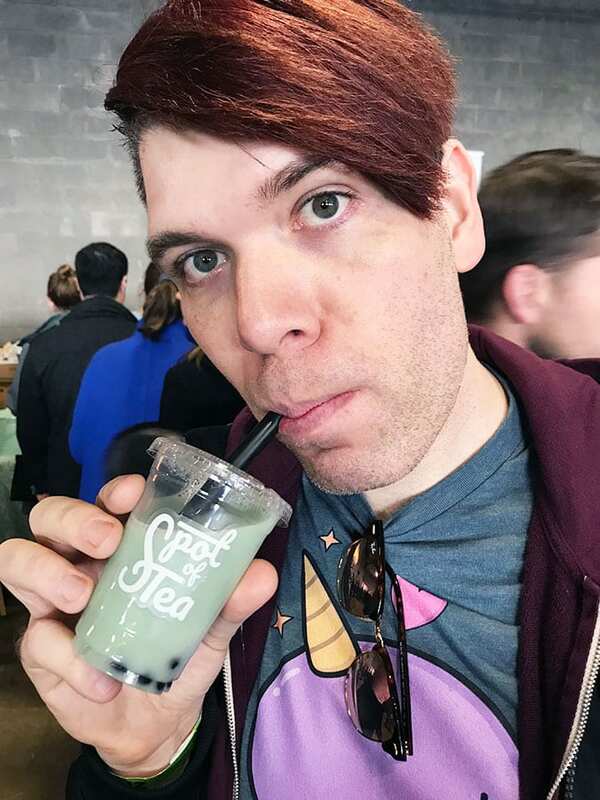 We are super excited to try this place for the very first time, and we are in love. Almost ate the entire box in one bite. 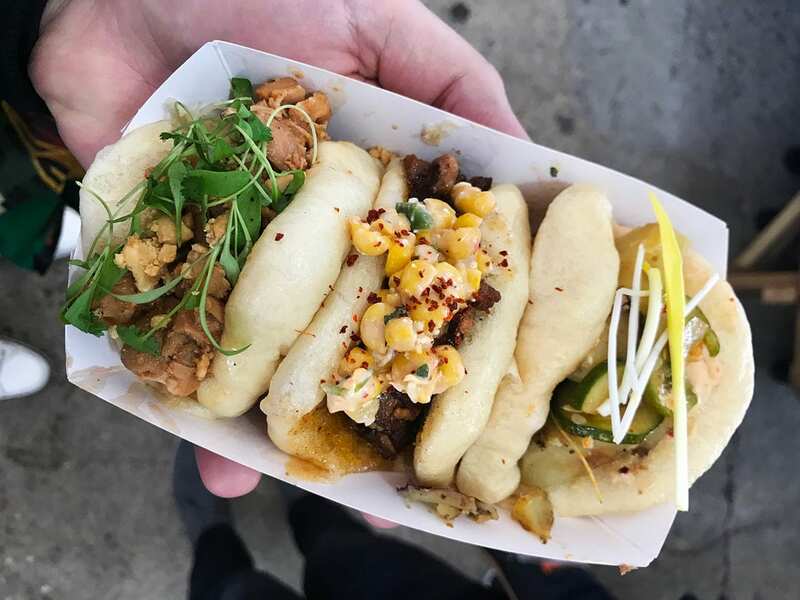 Three buns in one order, count us in because there is no reason to settle for one. 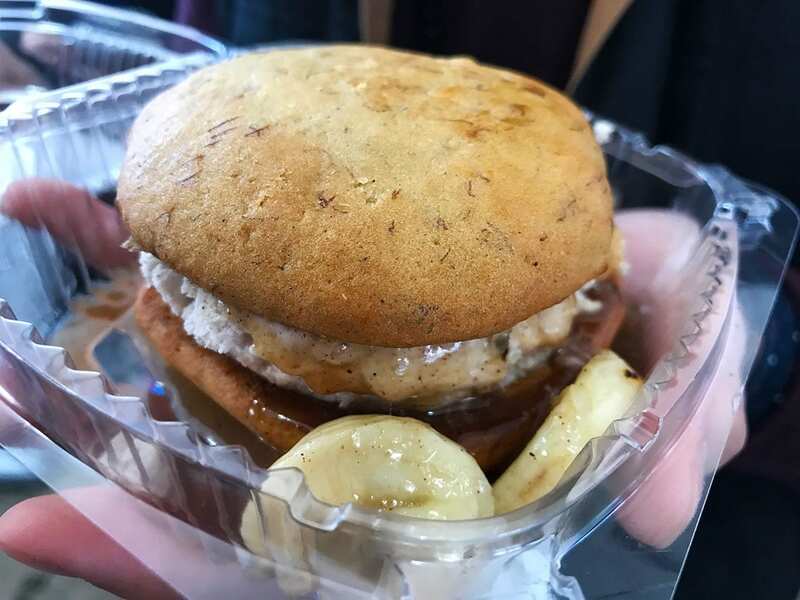 Pork Belly was our favorite, but we also enjoyed Miso Chicken Bun and Korean Sweet Potato. We like our Chicken Waffle how we like our man iron made! We have to admit that the hunky big armed men at the stand during Emporiyum first caught our eye. What makes these waffle icon? We don’t know, but maybe it has something to do with the special ingredient Bacon and Nutella. We think it might have just worked to capture our hungry taste buds. The waffle was soft with a crunchy exterior and complemented a well-prepared chicken. We can’t pass up a superhero-themed Little Miss Whoopie. Its all about the nerd pride here and what a great way to celebrate it if not with Dead Pool Whoopie ice cream sandwich. What makes this a Dead Pool themed dessert? 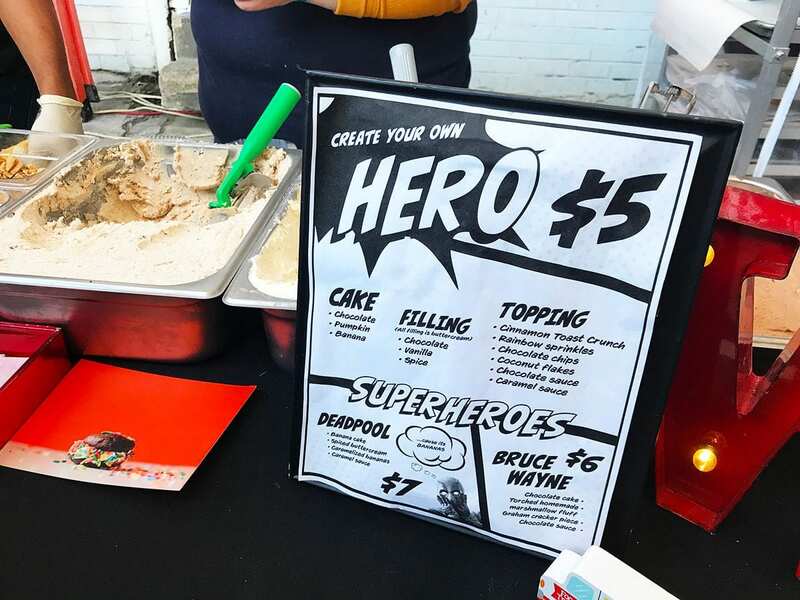 It’s probably the banana and spiced buttercream — tasty delicious with a kick and not overly too sweet, just like Dead Pool. The preparation alone was fun to watch as everything was made right in front of your eyes. Fried chicken you say? 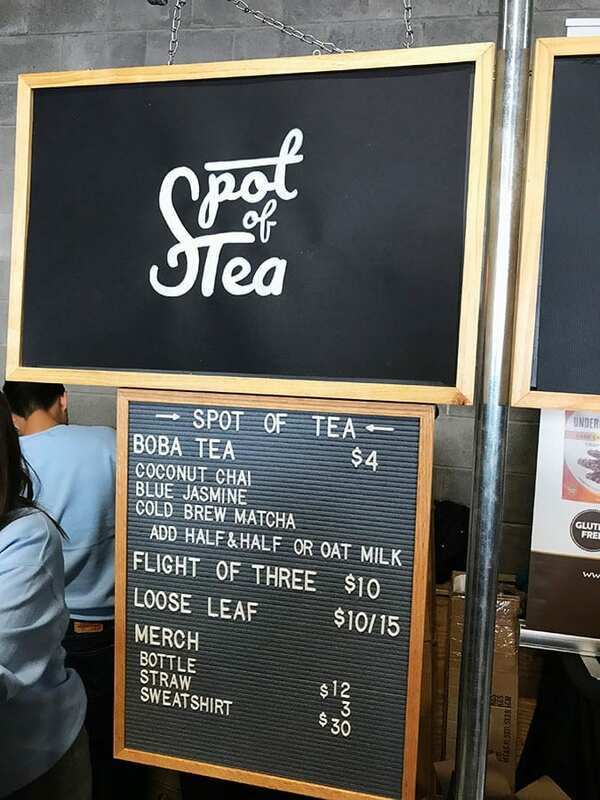 Well, don’t mind if we do order some. 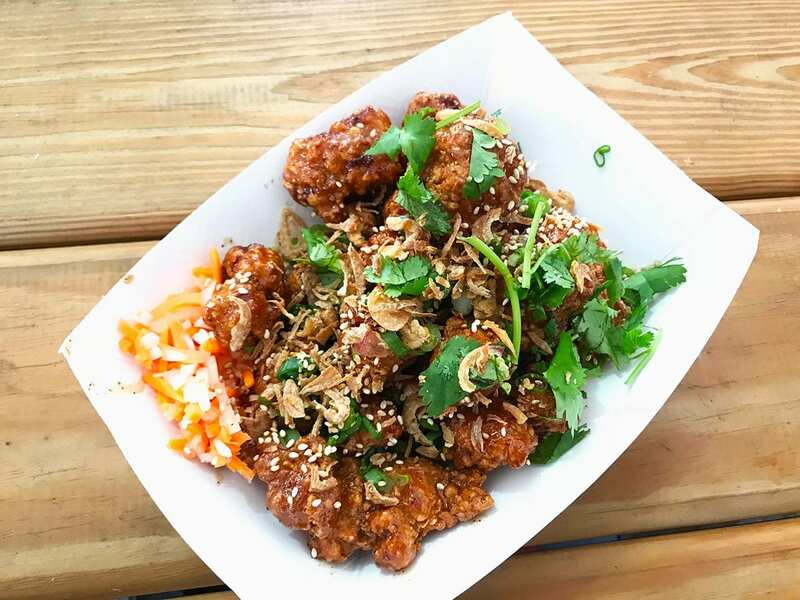 Maketto brings us their take on Taiwanese Fried Chicken. It might be just us, but Taiwanese version is way better than American Fried Chicken. It’s just so much more juicy and soft. It has something to do with little bit of fat they leave and the combination of crunchy breading with sauce. Love addition of some fried crispy onions, coleslaw, and smoked salmon flakes. 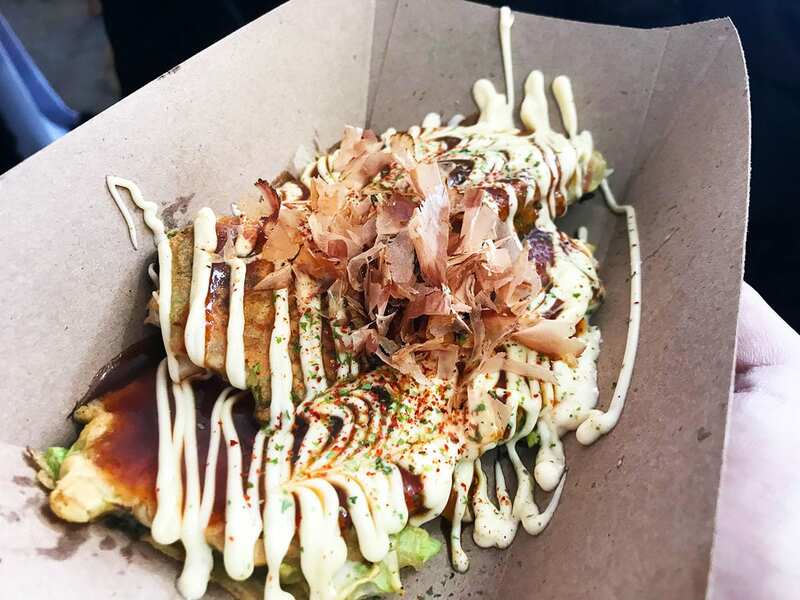 Maketto left a good impression on us with this dish. Now we know this Cambodian and Taiwanese restaurant is a must try for our future nomnom adventure. 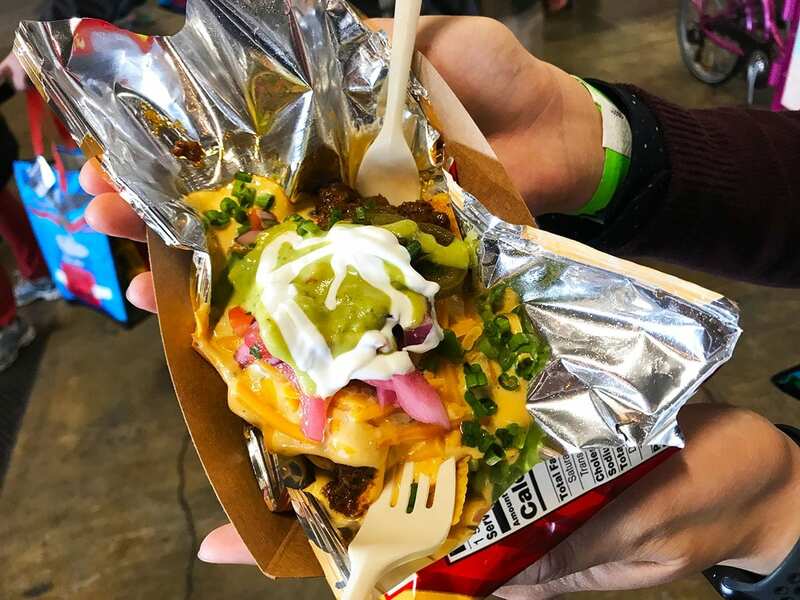 Our next Emporiyum stop is an interesting and unknown to us Brisket Chili Frito Pie from Republic Cantina. They are serving up something that we should know about but never heard of before. Its an entire bag of Fritos opened and covered with chili, cheese, guac and more. Let’s say our taste buds were interested in trying this. So if you are into chips, chili, and messy food, then this is a dish for yours. While we enjoyed a nice crunch and kicked, it didn’t capture our taste buds. OMG, we are so excited to try a Ramen Burger finally and from the original Ramen Burger by Keizo Shimamoto. Not surprised they are at Emporiyum as its the place where all the cool food places come. Ramen Burger exactly what you see a ramen noodle and burger combined into one great dish. Do we love the concepts? 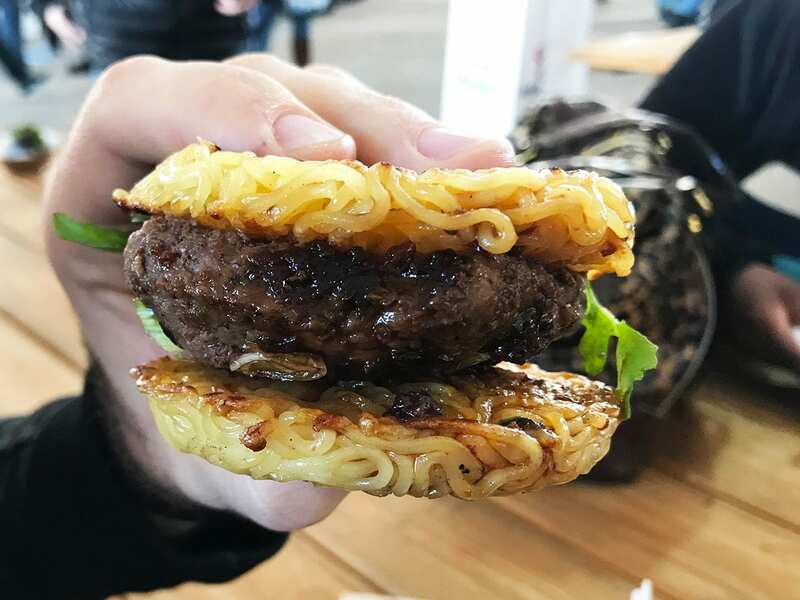 Yes, it combines two of our favorite things ramen noodles and burger. Did we love this? We enjoyed this dish but felt it was not as great as our taste buds were expecting. Overall, the ramen noodles overpowered and dominated the flavor. 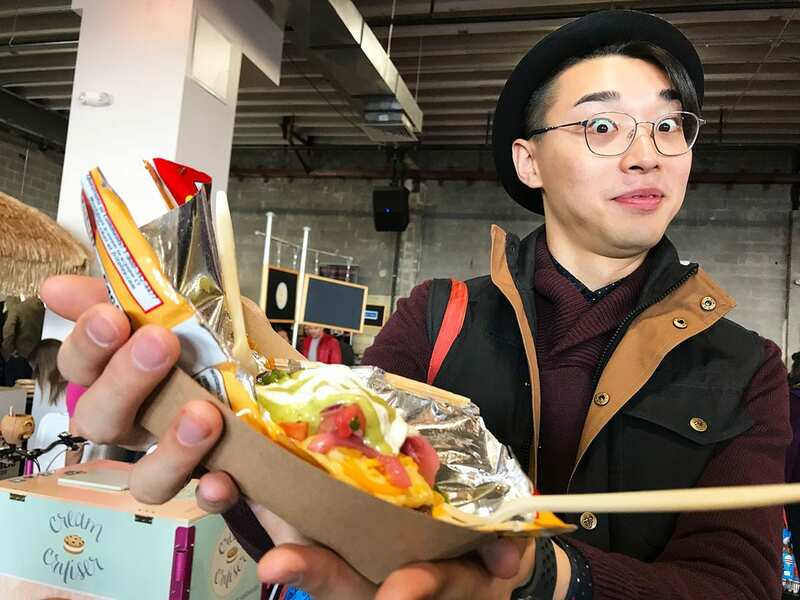 We realize that ramen burger was more of a tasting size so a full thing might come with a larger piece of meat. You know us, we are all into a thick and juicy piece of meat in our mouth. 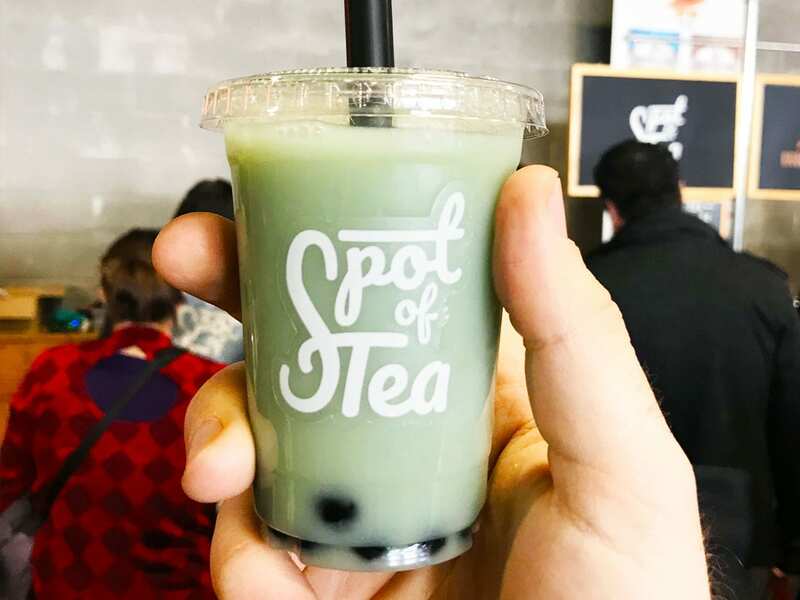 Bubble tea is taking over the DC area, and Spot of Tea is representing at Emporiyum with their tasty Blue Jasmine Bubble Tea. Very happy they offered tasting samples of each one, and we decided to go with something very new for us. Blue Jasmine was great, and we fell in love with the first sip. Very light and not overly too sweet. Are you looking for a snack and yet want to enjoy sweets? 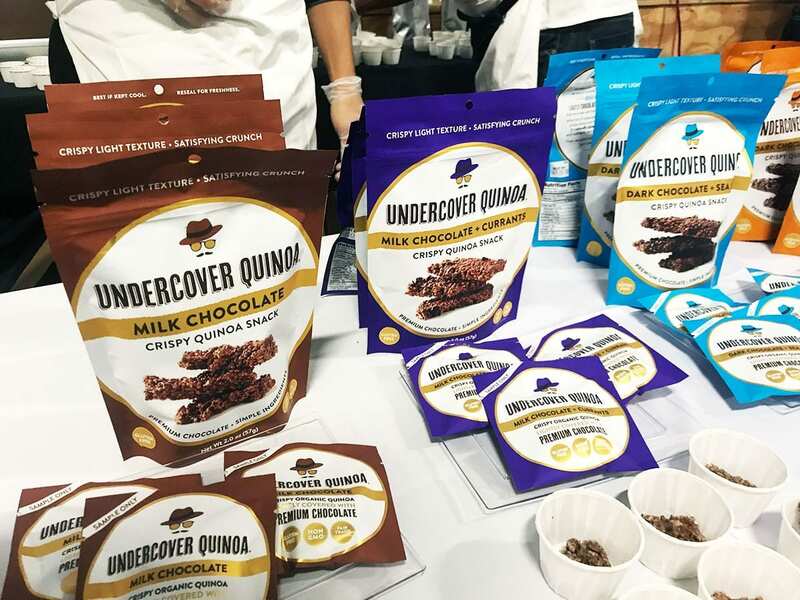 Then Undercover Quinoa is just for you with their low sugar and gluten-free quinoa chocolate snacks. Perfect for those moments when you are craving a snack. We ended up getting two packs for a test, Milk Chocolate Currants and Dark Chocolate with Seeds. Both were great and we couldn’t pick a favorite. 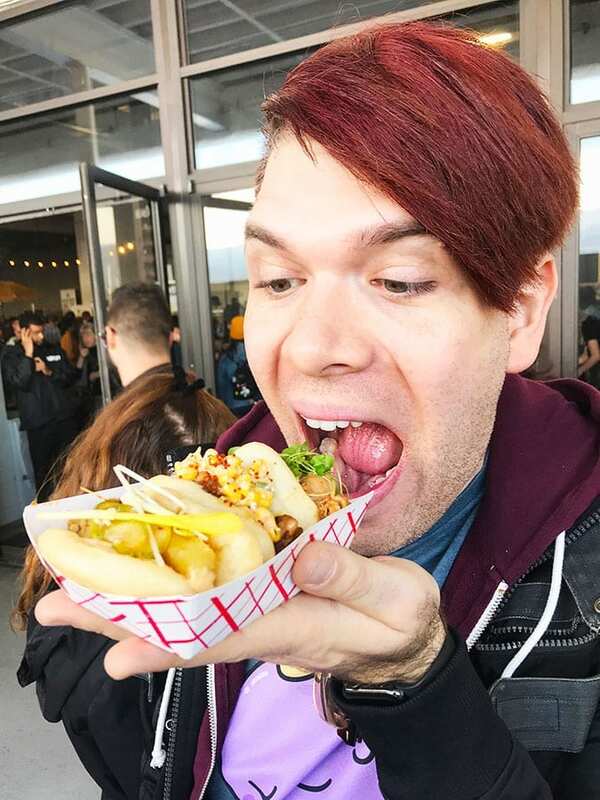 regardless of your choice, it will be nomnom. 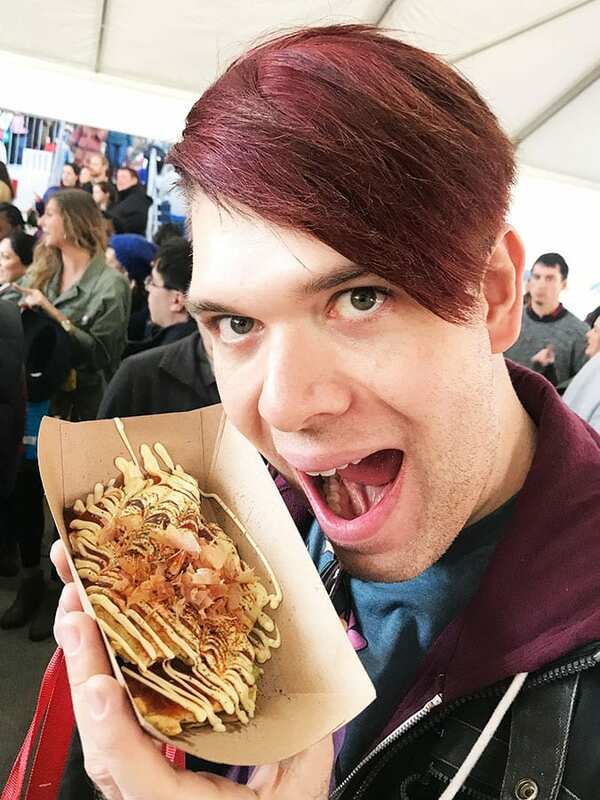 We are so excited to see Uzu back for another Emporiyum with their super nomnom Okonomiyaki. Just in case you didn’t read our last year review. 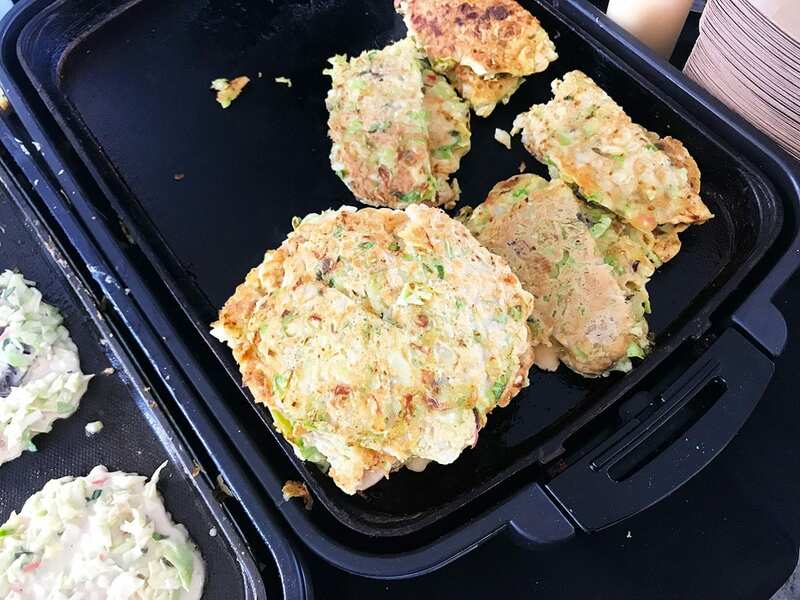 Okonomiyaki is a savory veggie pancake from Japan. So far we only know of Uzu that serves this great dish in DC area. Just love the thick, yet soft pancake covered with a sauce and smoked salmon flakes. Plus, they remembered us from last year. We always make a memorable impression. 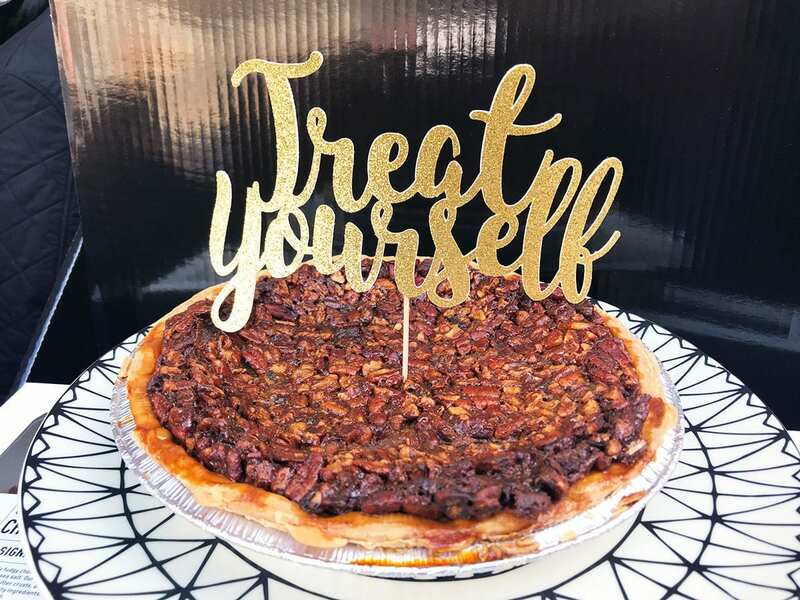 OMG that Bourbon Pecan Pie from Whisked looks amazing! I just wish they had some samples for tasting because Pecan Pie is our most favorite pie. It looks beautiful so we had to feature it on our Emporiyum nomnom list. COOOKIIES!!! We can’t pass up cookies and Whisked fed us some very tasty ones. So many different choices you are just as well try them all. 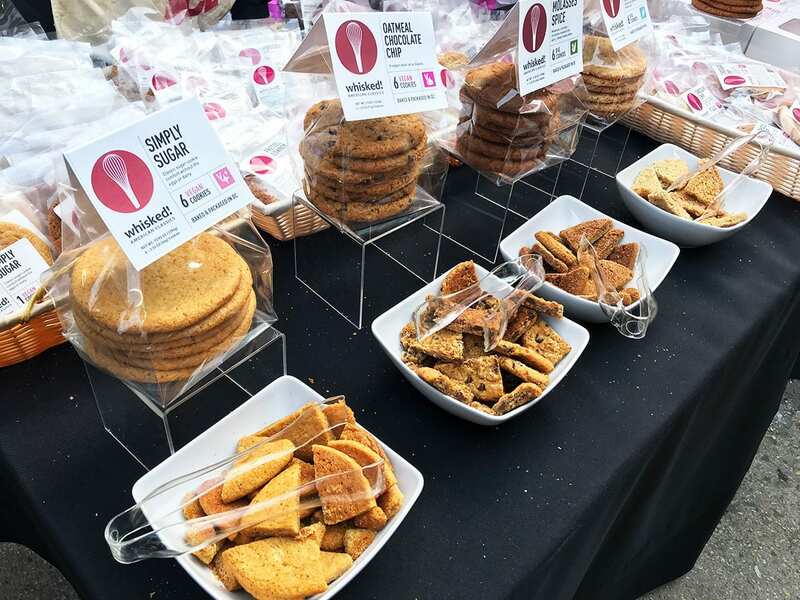 We loved their Raisen Cookies and Macademiam White Chocolate. 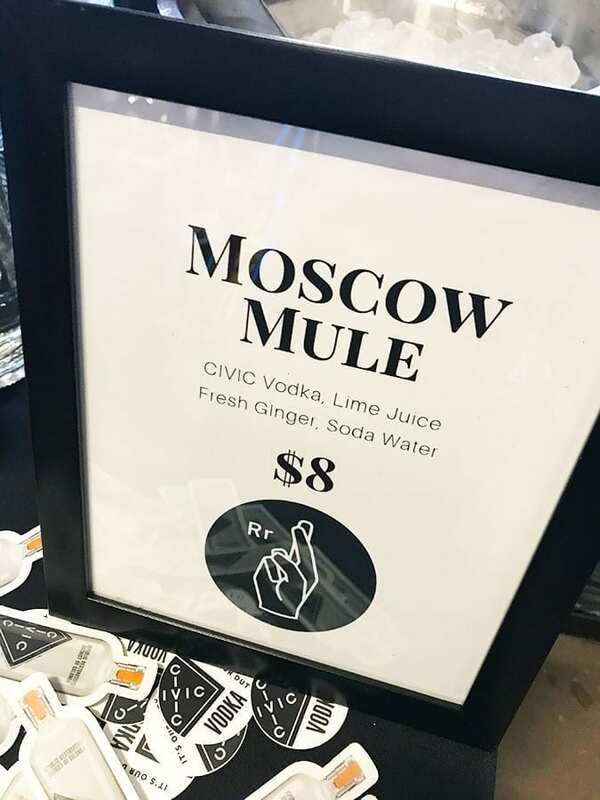 After eating so much food, we had to end it with some alcohol like this Moscow Mule with Civic Vodka from Republic Restoratives. Ah, it hit the spot and made us happy. 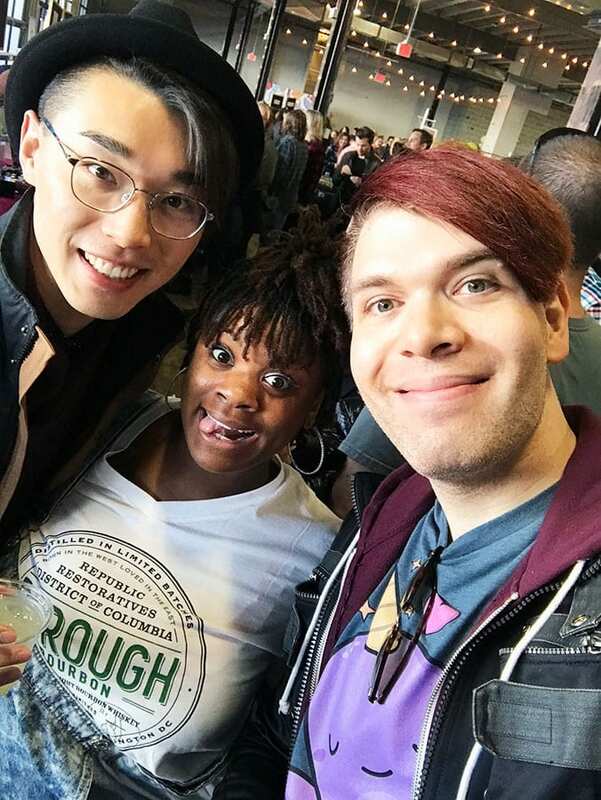 It was even more fun when the person pouring our drinks recognized us from another event, so we just had to grab a selfie together. 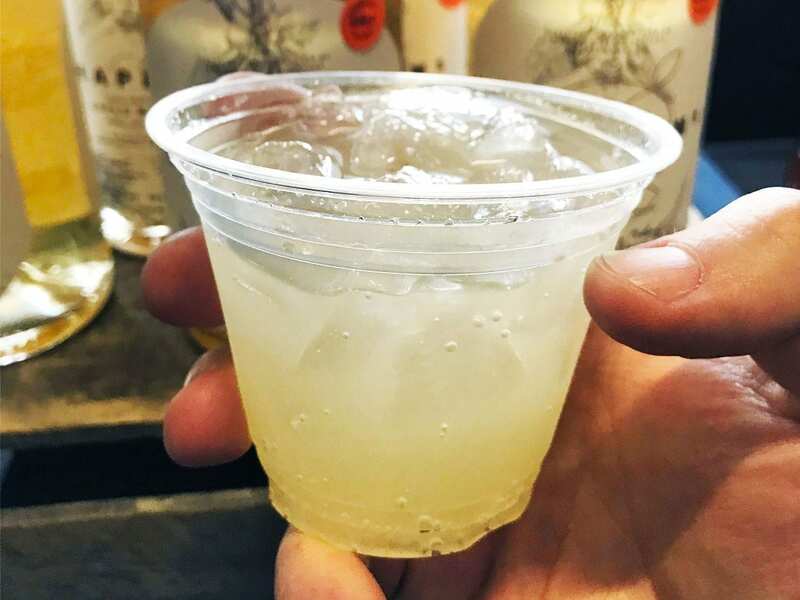 We can’t wait to attend one of their tasting rooms and distillery tours at Republic Restoratives.